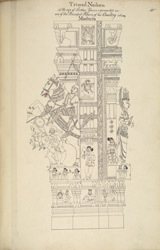 Pen and ink drawing of a column with an equestrian figure at the entrance of the Pudu Mandapam at the Minakshi Sundareshvara Temple, from an 'Album of 51 drawings (57 folios) of buildings, sculpture and paintings in the temple and choultry of Tirumala Nayyak at Madura. c.1801-05', by an anonymous artist working in the South India/Madurai style, c. 1801-1805. Each picture is inscribed with a title and a number in ink.